In October 2016 I did something unusual: I posted an ‘Intention’ (note the capital I) on my blog. The Intention was to put together a book – a collection of short stories in the SFF genre with the final aim of getting it published. At the time of declaring my Intention I knew I was a long way off completing the book because I didn’t have enough superb short stories to go in it, but I thought that it may take me (the reasonable time of) a year or so to finish it. Um, I was wrong…! For a start, I thought the collection would contain fantasy and science fiction stories, but a discussion with some friends on Facebook led me to the conclusion that keeping those two related, though very different, genres separate would be best. I do know of some writers – who are absolutely at the top of their game and winning awards for their writing – who mix and match genres in their collections, but I’m not (currently) one of those writers. Besides, the more I thought about it, the more the genre separation idea appealed. So I started off down a new route: one which involved writing and collating more sci-fi stories. And having had a little publishing success in that area, it confirmed to me that I was doing the right thing by concentrating on that one genre for the time being. *Watch this space/wish me luck! Reviews of Books by Women – Are There Enough? Although there are many successful women authors in the science fiction genre today, it still feels, at times, as though it’s a genre very much dominated by men. This came into stark relief for me when I attended a sci-fi panel at a lit fest a couple of years ago; the panel consisted of four white men, and I remember thinking: Really? What does this say about the genre? Do I, as a woman, have a chance of breaking into sci-fi? Am I confident enough to submit to a magazine where I don’t see that many stories by women being published? I was pleased to hear the chair of the panel apologize for the lack of diversity, saying that this wasn’t really representative of the genre, but when I questioned him on why, if this wasn’t representative of the genre, it had still come about, and whose responsibility was it – readers, writers, publishers, event organizers? – to ensure that panels (and the genre as a whole) were diverse, a good answer wasn’t forthcoming. But then I got heckled by a man at the back of the audience who called out, ‘But it’s all about the story!’ (the implication being a good story was a good story, no matter if a man or woman wrote it, but evidently these four men were superior at writing good stories… hmm). So that told me. When I became serious about reading more contemporary science fiction, I came across the then new(ish) sci-fi magazine Shoreline of Infinity. In search of a good read, I took a look through the reviews page and was immediately struck by a) how few books by women were being reviewed and b) how few of the reviewers were women. This wasn’t anything particularly startling; if, like me, you’re aware of VIDA, and their collated statistics, their findings over the past 8 years make for a depressing read – in pretty much all of the literary magazines/broadsheets they found that reviews of books by women, along with women reviewers, were in the minority. And yet it is women who are in the majority when it comes to being book buyers. I am now a reviewer for Shoreline of Infinity (in the main, I review books by women); I genuinely enjoy ‘doing my bit’ PLUS I get free books and get to exercise my critical reading skills. Bargain! And what I love about Shoreline is that they’re taking their low number of fiction submissions by women seriously. In fact, issue eleven will be a women-only issue. So if you’re a woman sci-fi writer, do check it out. Other exciting things happening right now are this: the well-respected indie publisher And Other Stories will be making 2018 a year of publishing women only (in response to Kamila Shamsie’s original call for a year of publishing women). Influx Press have a current call for submissions from women of colour only. And Linen Press and Mslexia are continually open to submissions by women only. My press, Mother’s Milk Books, considers submissions from both men and women, but I tend to get a lot more submissions from women than men. I think some male writers may consider my press too “motherly” or too “milky” for them! I would actually encourage any writer/reader to take up reviewing for a magazine, or, if reviewing for a magazine isn’t for you, then there’s other platforms to review on – a personal blog, Twitter, Instagram, Amazon, Goodreads etc. These are all good places to help spread the word about books by women. I will leave you with the following reviews and a little nudge: go write a considered review of a book by a woman (bonus points for it being published by an indie press!). ‘Never judge a book by its cover’ so the saying goes, but of course we all do, and Unsung Stories, a fab indie press, have a particular skill in creating great covers, so I wanted to read Pseudotooth the moment I set eyes on the cover. Since most of my writing this year has concentrated on short stories, most of my reading has been of short story collections and anthologies, so I became rather worried about whether I’d actually be able to read a whole novel. And at just over 400 pages, Pseudotooth is a long novel. But, considering its length, it was a compelling read, and I seemed to fly through it. Pseudotooth is a difficult-to-categorise novel though. It’s not exactly magical realism, but not quite speculative fiction either; yet the writing is lyrical, the narrative dreamlike, the themes – trauma, mental health, otherness – powerful and thought-provoking. The protagonist, a young woman called Aisling Selkirk who is having unexplained blackouts (pseudo-seizures), is a well-drawn and sympathetic character, the milieu (first, the austere and chilling parsonage, and then the is-it-real-is-it-not realm of ‘Our Friend’) fascinatingly image-rich. I’m not entirely sure the more open-ended ending is for me (I love a good strong resolution) but I think that’s very much up to the individual reader. Pseudotooth really got me thinking about the issue of how best to support young adults with mental health issues, and I would love to discuss it with any one else who has read it. Bone Ovation is a debut poetry pamphlet, published by Valley Press, another indie press I greatly appreciate. As I’ve mentioned before, I find it takes me a long time to read a full poetry collection, but pamphlets are a brilliant way to slip some poetry into your day. You can carry them in a coat pocket or bag and dip in (and out) of them easily. The theme of the pamphlet is ‘bones’ and in many of the poems the theme is obvious, in others, not so much. Many of the poems are written from a woman’s point of view, or are about a particular woman; I loved some of the characters – the girl from ‘The Girl Who Fell in Love With the Mountain’, the enigmatic being from ‘The Paper Woman’, the woman from ‘The Woman is Like a Picasso’. But my favourite is definitely the soul-gobbling grandmother from ‘The Rains’. their loved ones once more in the mortal world. a tear drop – a thin, translucent meridian. and would tip back her head and eat the rain. She said it made her feel alive again. Reading this collection I was struck by how, in places, it reminded me of Angela Readman’s The Book of Tides, a very fine collection indeed, due to the striking imagery, the layered and rich vocabulary, the magical/fantastical themes throughout. Yes, there were (to my mind) some poems that weren’t wholly successful, either because they were too opaque for my taste, or they had the occasional line which had end rhymes or internal rhymes that didn’t quite work, but overall, I felt this to be a strong debut, and one that makes me want to read more from this up-and-coming author. This is a slim, self-published collection of 5 tales about womanhood and motherhood. I actually read this a fair while ago and meant to review it a lot earlier, but of course, life got in the way. The stories remind me of traditional fairy tales since they are plainly-written, with no literary frills added for effect. Some of the tales are tragic, some are resolutely happy, some are instructive. The whole collection makes for an easy, uplifting read and I remember really looking forward to ‘treating myself’ to another story because they felt so full of love, so familiar, so comforting. And really, what more can a reader (especially one who loves fairy tales) ask for from a book? Thank you Jessica! And finally… huge thanks and WELL DONE to Sara for all her hard work on The Prompt linky. 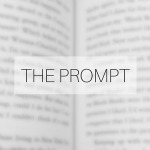 I am sorry to hear that this is the last ever The Prompt link-up (this week’s prompt was ENOUGH) but I am sure that Sara will continue to keep on inspiring and connecting (in particular) women writers.